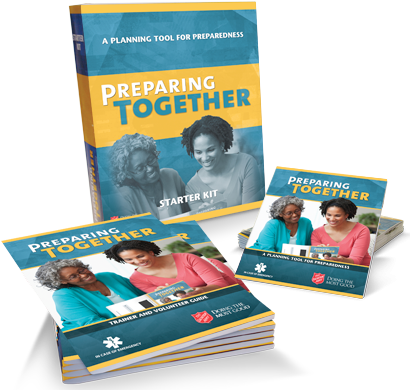 Preparing Together is a volunteer-driven initiative developed by The Salvation Army Emergency Disaster Services to assist senior citizens and people with disabilities in the event of a disaster. This personalized safety plan addresses many of the challenges that put people at risk during a disaster. With the Preparing Together program, each volunteer makes periodic visits to ensure that safety measures identified in the plan are in place. A Planning Tool is available to organize important information and to provide guidance in preparing and implementing the plan for emergencies of all types. There are two ways in which you can train volunteers to assist those in need. Motivated by the love of God, as a leader in Christian faith-based human services, The Salvation Army is committed to serve the whole person, body, soul and spirit, with integrity and respect, using creative solutions to positively transform lives. Its objects are the advancement of the Christian religion of education, the relief of poverty, and other charitable objects beneficial to society or the community of mankind as a whole. Today, through over 3,500 service centers in the eastern region of the United States, The Army’s spiritual and social services assist millions of homeless, working poor, children, youth, addicted, elderly, and abused families and individuals. For more information about The Salvation Army, please visit The Salvation Army USA National web site. Additional information about The Salvation Army’s global presence and activities can be found online at The Salvation Army website, www.SalvationArmyUSA.org. The Salvation Army is officially recognized by federal, state and local governments across the country as a sanctioned disaster relief and assistance organization. As a relief organization within the National Voluntary Organizations Active in Disaster (NVOAD), The Salvation Army was involved in the development of the Federal Emergency Management Agency’s (FEMA) National Response Framework. The Army is recognized within this framework as an organization able to provide relief services to communities impacted by both natural and man-made disasters until the service is no longer needed by the community. When initiating a disaster relief operation, the first aim is to meet the basic needs of those who have been affected, both survivors and first responders. Even at this level, The Salvation Army’s workers are ministering in that they serve as a means of expressing God’s love to those in need. Disasters come in, both natural and man-made forms. Each year, The Salvation Army serves 1—2 million Americans in dozens of disaster response efforts nationwide. And when disaster strikes, The Salvation Army is often among the first on the scene. Our trained personnel are always available to meet emergencies by providing food, shelter, clothing and spiritual comfort. In disaster relief operation, The Salvation Army’s first aim is to meet the basic needs of those affected – both survivors and first responders. Our goal is to see that any individual requiring some level of assistance during a disaster, either during evacuation or when sheltering in place, would be paired with a Preparing Together volunteer.